San Francisco’s Book Passage bookstore is one of the great American independent bookstores. Anyone with more than a passing interest in travel literature also knows it as the home of the Annual Travel Writers and Photographers Conference, which this year has expanded to cover food writers. At the helm of this lively festival is Don George, a travel writer and editor who is a contributing editor to National Geographic Traveler. George was the travel editor at the San Francisco Examiner & Chronicle, founded and edited the Wanderlust section of Salon.com, and most recently was Global Travel Editor at Lonely Planet Publications. 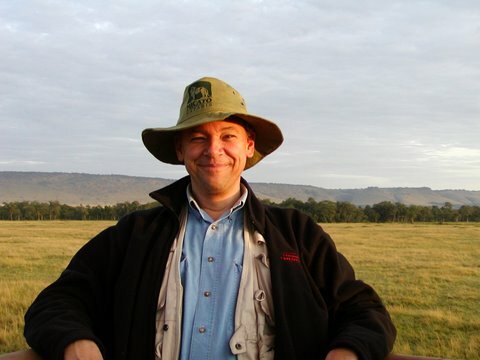 He is the author of The Lonely Planet Guide to Travel Writing and the editor of six literary travel anthologies, including The Kindness of Strangers, Tales from Nowhere, and By the Seat of My Pants. I caught up with Don to ask him about this year’s Conference, which runs from August 12-15, 2010. Everett Potter: Don this year marks the 19th Annual Book Passage Travel, Food & Photography Conference. How did the conference originate? Don George: The conference began when I was the Travel Editor at the San Francisco Examiner & Chronicle and Elaine Petrocelli, the owner of Book Passage bookstore in Corte Madera, Marin County, called with “a crazy idea”: How about, she said, putting together a multi-day conference for aspiring travel writers, with workshops and panels featuring notable writers, editors, agents and publishers? I loved the idea and invited Jan Morris to be our first guest of honor. She graciously agreed and the conference was born. The first conference was a resounding success and we have expanded and refined it through the years. We added photography in our third year and have developed a schedule that seems to work well: a tiered track of six morning workshops (ranging from blogging to writing for newspapers and magazines to crafting a memoir to photography), afternoon panels spanning a wide range of insider advice, and festive evening events with renowned writers and photographers, with a lot of informal socializing time built in as well. EP: How long have you been at the helm of the conference? DG: I’ve been the Conference Chair since the beginning – and have loved helping steer the evolution of the conference to keep pace with changes in travel writing and photography publishing. As one example, our first conference focused on writing for newspapers and magazines; this year we’ve expanded to include a workshop on “travel writing and blogging for the digital age” led by Jim Benning of WorldHum and renowned blogger Jen Leo, plus panels on using social media and web sites to publish and promote your work. I’ve also been thrilled and humbled by hearing success stories year after year from conference graduates who have gone on to write and photograph for newspapers, magazines and web sites and to publish guidebooks and narratives; a number of our former “students” are now members of the conference faculty. It’s been an extraordinary journey. EP: Has there always been a food component or was it pure travel at one point? DG: We just added the food component this year, and I’m extremely excited about it. Food is of course a fundamental part of the travel experience, and content focusing on food and travel – in magazines such as Saveur, Sunset, and Food and Wine and TV programs such as No Reservations – has gotten increasingly sophisticated in recent years. (In fact, I just finished compiling a new anthology of food and travel tales, called A Moveable Feast, that will be published this October by Lonely Planet.) Our foodie faculty members include TV personalities Tyler Florence and Joanne Weir, blogger Amy Sherman, editor Amy Treadwell and writer Georgeanne Brennan. I think adding food writing and photography will enrich the conference on many levels. 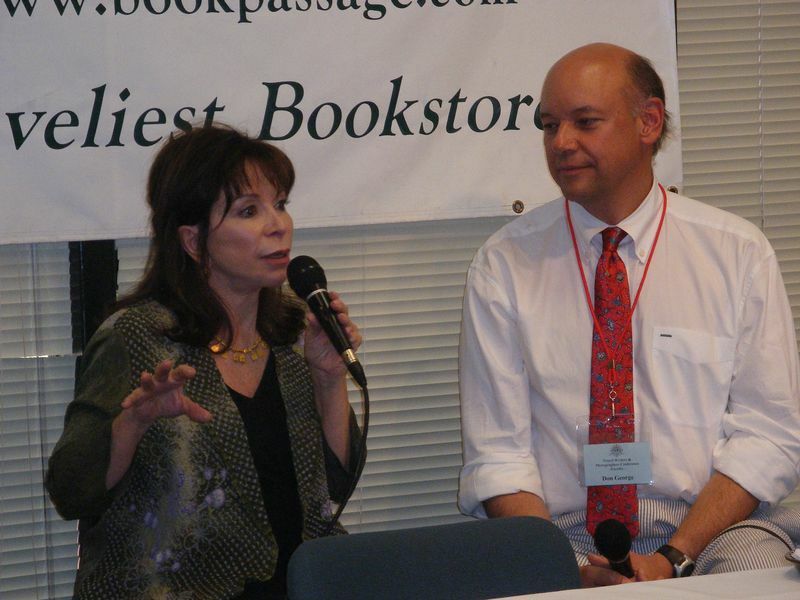 Isabel Allende and Don George. EP: You’ve got the legendary Tim Cahill, this year, among others. Which major writers have you had in the past? DG: Yes, I’m thrilled that Tim has agreed to teach an intensive morning workshop for writers this year. From the beginning, featuring great writers who are masters of their craft and also generous in sharing their tips and tales has been a hallmark of the conference. Our previous guests of honor have included Pico Iyer, Bill Bryson, Isabel Allende, Simon Winchester, Peter Mayle, Peter Matthiessen, and Amy Tan. This year we’ll have Carl Hoffman and David Farley in addition to Tim. EP: How about the teaching element. I understand that participants can have 30-minute private consultations. What do those entail and how popular are they? DG: Teaching is a major part of the conference. The six workshop tracks I mentioned before meet on Friday, Saturday and Sunday morning from 9:00-12:00. These give the faculty a thorough opportunity to impart what they’ve learned in their careers and to present students with in-class writing and photography exercises and critiques. As you just mentioned, we also offer the option of 30-minute private one-on-one consultations, for an additional fee. When you sign up for one of these, you can request a meeting with any member of the faculty – writer, editor, agent, blogger — and focus on whatever you want for 30 minutes. Sometimes a writer wants a very close reading and critique of an article or a book proposal they’ve written along with suggestions about where to try to publish it; sometimes a participant wants advice about their web site; and sometimes participants wants to ask broader questions about their career path and choice of professional focus. EP: Next year is a big one, the 20th. Have you lined up anyone yet? DG: Right now we’re focused on making sure #19 is the best conference yet. But we have had a few brainstorming sessions where we have come up with some very exciting ideas about #20 – and I’m sure we’ll get many more suggestions and inspirations this August. Ask me again in a couple of months! I’m proud to count myself as a conference gradute. This is a great conference for aspiring travel writers. The conference faculty are very knowledgeable and approachable.